This stylish soundbar is meant to be heard, not seen. That’s why we engineered custom-designed drivers to keep the Bose Soundbar 700 almost impossibly thin, without taking away from the acoustic excellence Bose is known for. Measuring only 5 centimetres high, its profile fits discreetly under your TV screen, so you won’t even know it’s there—until you hear it. And with Amazon Alexa built in, you won’t have to lift a finger. Like the Bose Soundbar 700, it’s the little things that make a big difference. 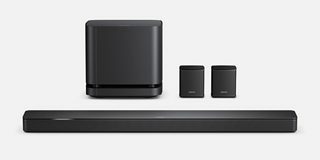 It may be our thinnest soundbar yet, but its powerful acoustics fill the entire room with sound you just have to hear to believe. Come and visit us to experience it for yourself. With Amazon Alexa built right into the Bose Soundbar 700, you can control your music, get information, manage your day and so much more. * You have access to everything Alexa has to offer—all without lifting a finger. But what good is Alexa if she can’t hear you? Experience superior voice pickup from a custom-designed eight-microphone array that will still hear you, no matter how loud your music is. And an ingenious light bar will help visually indicate when Alexa is listening, thinking or speaking. Plus, it just keeps on getting better. Future software updates will unlock new features. Make the most of your listening experience. You won’t believe what the Bose Soundbar 700 can do on its own, but we have more whenever you’re ready. Add the Bose Bass Module 700 for more room-rocking sound. It’s thunderous bass in a compact, 25-cm cube. Combine it with the Bose Surround Speakers for the ultimate home entertainment experience and feel like you’re in the centre of all the action.